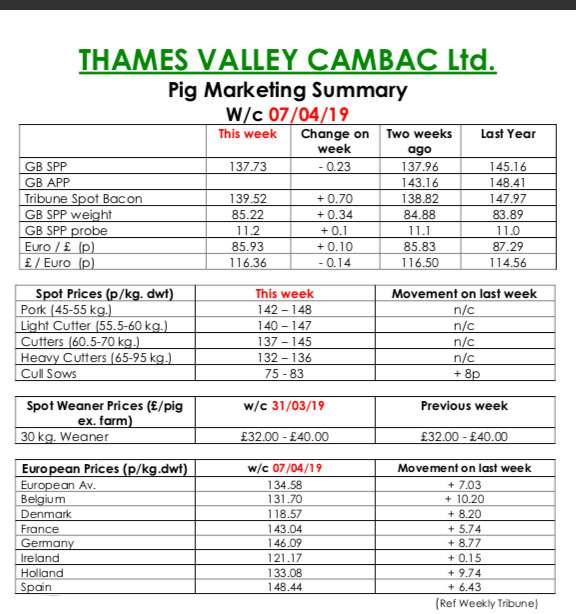 This week’s Slaughter Pig Marketing Summary from Thames Valley Cambac reported that factory reliability remained the issue again this week, with three of the majors breaking down unfortunately all on the same day/week. 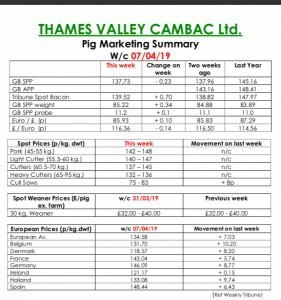 This kept keeping a lid on the potential price rises we were hoping to see, which inevitably meant us rolling a number of pigs down the week, and even into the weekend in order to catch up on lost kill time. However, we did see marginal increases in some processor contributions but not the increase’s like the Europeans have seen. The anticipated reduction in numbers as a consequence of summer infertility, leading to poorer weaning’s, are now starting to show with slaughter numbers drying up. We expect this trend to last for a number of weeks. Germany were again up 10 eurocents, influencing their neighbouring countries to follow this trend. This is all fuelled by the Chinese and their ASF woes, which INTL FCStone quoted the disease outbreak could create a global protein shortage of 12.3 million tonnes. The cull sow market also followed suit, up again by 8p equating to a 25p rise in the last five weeks. Price quotes in sterling were marginally up by a slightly stronger Euro that ended the week up 0.10p at 85.93p. The Weaner Marketing Summary, for week commencing March 31, reported that demand again was a touch better this week, but prices pretty much stood on. Supplies of 7kg weaners are still relatively stable, but there is a significant shortage of 30kg stores. The prices announced by the AHDB saw 30kgs store pigs at £47.87, and the weighted average for a 7kg weaner down 22p to £35.23.